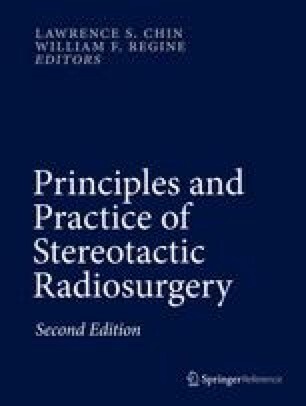 Stereotactic radiosurgery has developed an increasingly important role in the management of brain metastases. However, its use has also sparked controversy about the appropriate treatment for patients with brain metastases. Studies have shown benefits of SRS as sole treatment, as adjuvant therapy after surgery, as an adjunct to WBRT, and as salvage treatment after WBRT. Retrospective studies suggest that patients treated with SRS or surgery have comparable outcomes. RTOG 9508 provides level 1 evidence of a survival benefit of SRS and WBRT compared with WBRT alone for patients with a single lesion. For patients with more than one lesion, the use of SRS and WBRT should be considered based on performance status, extent and activity of extracranial disease, and steroid use. More recently, the omission of WBRT has been advocated by concerns of the potential risks of cognitive decline with WBRT and apparent lack of survival benefit of additional WBRT. Surgical resection followed by SRS boost exhibits good local control for single brain metastasis. The potential cognitive side effects of WBRT must be balanced against the risk for increased distant brain metastases and the cost of more frequent follow-up scans when treating brain metastases with SRS alone. A recent phase III trial has shown benefit in cognition for patients undergoing WBRT who take memantine. As the prognosis improves for cancer patients, the challenge of increasing progression free survival while limiting cognitive decline and other side effects will continue to make the management of brain metastases controversial. History: This is a 73-year-old male with a history of renal cell carcinoma status post right nephrectomy 10 years ago. He presented with left-sided weakness. MRI was obtained, which revealed a 1.7 cm right frontal lesion (Fig. 14.1a, b). Staging work-up was negative. He underwent Gamma Knife radiosurgery to the right frontal lesion (Fig. 14.1c). A dose of 24 Gy was prescribed to the 50 % local isodose line, which covered 100 % of the target. The plan utilized 8 shots using an 8 mm helmet without plugs. Tumor volume = 2.0 cm3. Maximum dose = 4,800 cGy. Maximum diameter = 1.9 cm. MD/PD = 2.00. PIV/TV = 1.70. 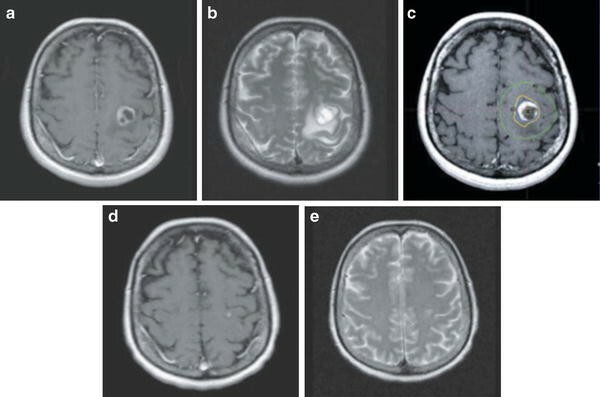 Three-month post Gamma Knife radiosurgery MRI (Fig. 14.1d, e). The patient’s left-sided weakness improved. History: This is a 57-year-old female with history of a T3N1M0, Stage III adenocarcinoma of the esophagus status post radiation therapy (3,000 cGy/20 fx, 150 cGy/fx bid) to the distal esophagus with concurrent chemotherapy status post esophageal resection followed by an additional 3,000 cGy/20 fx, 150 cGy/fx bid to the tumor bed with concurrent chemotherapy. She did well for 10 months until she presented with a right-sided seizure. MRI revealed a 2-cm left frontoparietal lesion (Fig. 14.2a, b). 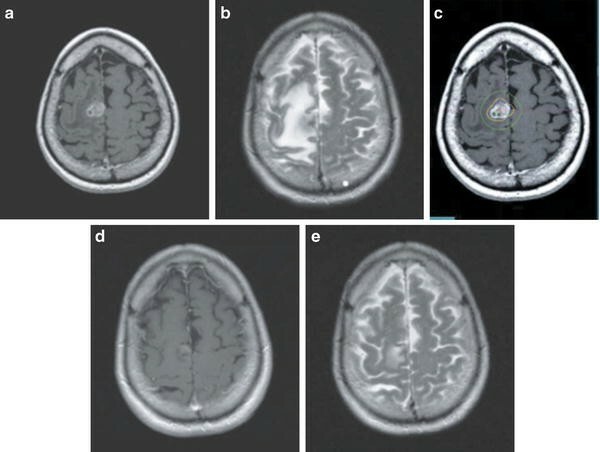 She underwent whole brain radiation therapy (3,750 cGy/15 fx using 250 cGy) followed by Gamma Knife radiosurgery within 1 week of completing WBRT (Fig. 14.2c). Treatment planning information, 1,800 cGy was prescribed to the 50 % isodose line, which covered 100 % of the target. The plan utilized 6 shots using an 18 mm helmet without plugs. Tumor volume = 5.3 cm3. Maximum dose = 36 Gy. Maximum diameter = 2.5 cm. MD/PD = 2.00. PIV/TV = 1.64. Three-month post Gamma Knife radiosurgery film (Fig. 14.2d, e). She had excellent response to WBRT and Gamma Knife radiosurgery.